A recent whirl wind trip across the U.S took Redback One to El Paso, TX for the 2011 SOG Border Security Conference. We invited SORD USA to join us at the booth to display the latest range of tactical nylon products that included the RB1 Elite Series product range. On the second day we were able to demonstrate our training methodology through a series of live fire drills at McGregor Range Complex. We gave demonstrations of our square range techniques of andvanced weapons manipulation then two live fire demonstrations of Combat Clearance and Hostage Rescue in the Shoothouse. Everyone was suitably impressed with the demonstrations. From there, it was off to California for the 2-Day Advanced Tactical Carbine course, held at the Eagles Nest range in Angeles, CA. Despite the high winds during the first day, the students had a great time learning advanced weapons manipulations and tactical movement techniques that concluded in a run and gun stress course that incorporated plenty of running, assembling weapons, medium range targets at 150m standing, 225m targets kneeling and 300m targets prone, followed by two surprise targets in the low ground at 100m and 175m. Both of these targets had to be engaged with rifle then with pistol during a change over drill. 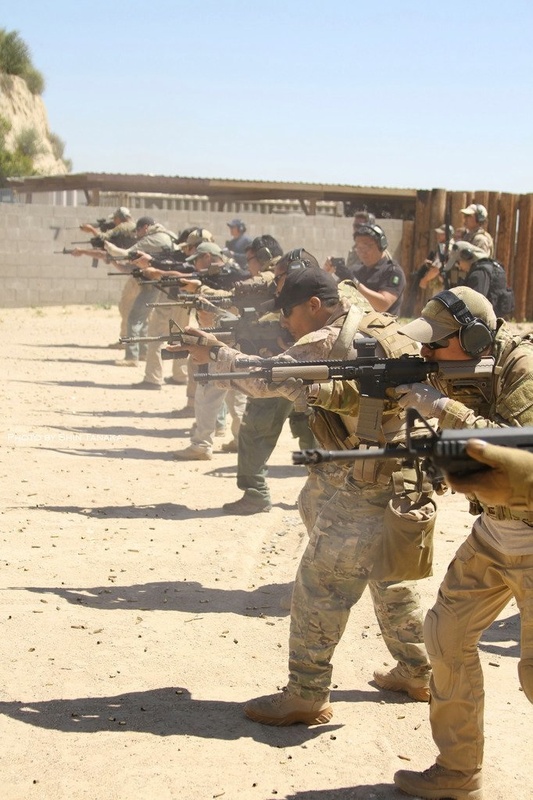 From there is was a reload on the run to a support shoulder clearance and engage a close range target from the support shoulder, a quick switch back to strong side and sprint down range to engage an IDPA target with a 6 round cadence drill. High port turn and go, back up range 55m to a prone support side shot onto another IPDA target to finish. Everyone did a great job completing the course of fire with some really great times that had me putting in the big ones to ensure that I stayed head of the course. At the completion of the course several of the students went out for an end of course dinner at which we all heard the news of the demise of UBL. There was plenty of celebratory drinks all round! 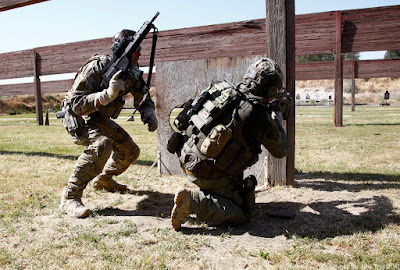 The next day was a slight change of gears and a change of curriculum for the 2-Day Tactical Carbine Course for Brea SWAT at the Prado Shooting Center in Chino, CA. We had several departments attend this course due to the multi-jurisdictional team. We also had some patrol officers on the course too. The interesting point on this course was that all students arrived with the HK G36 carbine or rifle. There were a couple of shooters that were using M4's also. So I strapped a G36R to my back to ensure that I was able to demonstrate all drills with both M4 and G36. Everyone learnt plenty of new tricks and tweaked pre-existing skills with the advanced weapons concepts that we put out on our training courses. We finished up around 1830. I quickly grabbed a shower and change of clothes then off to LAX for the red-eye to Washington DC to prepare for a high level security presentation for an elite group of influential women operating business' in the DC area. This was a change of gears, swapping guns, armor and multicam for a pin strip business suit and tie. The presentation was a great success for our company's latest addition RB1 Consulting. This side of the business offers security services covering a wide spectrum from Mission Analysis, Risk Assessment, Advisory Services, Provisional services including boots-on-the-ground and full spectrum equipment procurement. We are very pleased to include former Tier 1 U.S Army Special Operations personnel to the RB1 cadre staff to assist with both the operational and training sides of Redback One. More on this later.